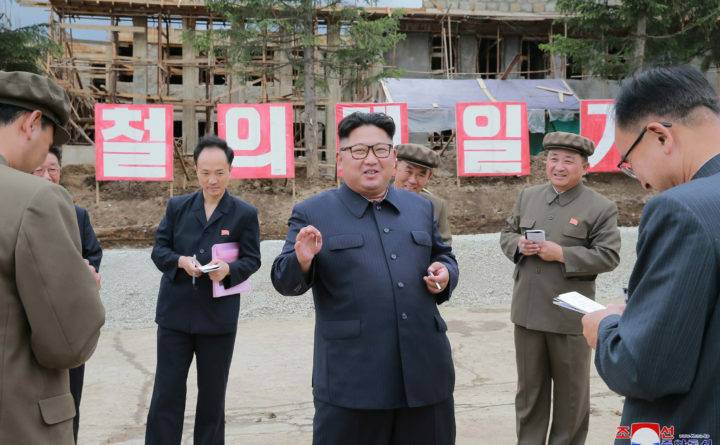 In this undated photo provided on July 10, 2018, by the North Korean government, North Korean leader Kim Jong Un, center, visits a construction site in Samjiyon County, North Korea. Independent journalists were not given access to cover the event depicted in this image distributed by the North Korean government. The content of this image is as provided and cannot be independently verified. Korean language watermark on image as provided by source reads: "KCNA" which is the abbreviation for Korean Central News Agency. SEOUL, South Korea — North Korean officials did not turn up to a Thursday meeting with the U.S. military about repatriating the remains of the war dead, according to a U.S. official with knowledge of the situation. The two sides had been expected to discuss at the Korean Peninsula’s demilitarized zone the return of U.S. troop remains from the 1950-1953 war — an arrangement that the State Department had announced after Secretary Mike Pompeo’s visit to Pyongyang last Friday and Saturday. State Department officials had said that the meeting would likely take place on July 12, though they added that the date could shift. On Thursday, however, Department of Defense and United Nations Command officials were left waiting in the DMZ’s Joint Security Area. The expected North Korean officials never arrived, according to the official who requested anonymity as he was not permitted to talk publicly about the event. It was not immediately clear why North Korean officials had not attended the meeting or whether they had ever confirmed their intention to. The State Department did not respond to a request for comment. Ahead of the summit in Singapore, North Korean officials sometimes did not turn up to meetings where their U.S. counterparts were expecting them, causing tension between the two negotiating partners. The repatriation of the remains of U.S. soldiers from North Korea has been a major issue between Washington and Pyongyang since the end of the Korean War, when thousands of Americans were left in Korea either missing in action or as prisoners of war. Hundreds of remains have been repatriated since 1990, but the process has been fraught with mistrust. The transfer of remains between North Korea and the United States has not taken place since 2005. Trump told a crowd of supporters a week later that the remains of 200 Americans “have been sent back.” Military officials later denied that, but told reporters that they expected the remains to arrive within days and had made arrangements for their arrival, such as storing caskets near the DMZ. Roh Kyu-deok, a spokesman for South Korea’s Foreign Ministry, said the South Korean government is “constantly in contact with the U.S. counterpart” about progress of the talks on war remains repatriation, but declined to comment on any details, saying that all inquiries on the issue be directed to the U.S. authorities. According to estimates from the Pentagon, 7,700 U.S. troops are still unaccounted for from the Korean War. 5,300 of that number are believed to have been killed north of the 38th parallel, which marks the border between the two Koreas. Washington Post writer Min Joo Kim contributed to this report.